There are several petitions circulating the internet that could really use your signature and signal boost. Please sign and share them with your family and friends. 1. 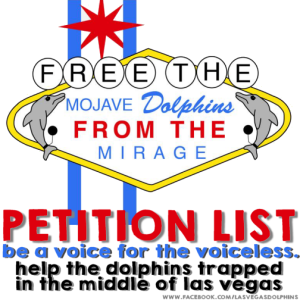 Clark County School Distict: Stop sending students to the Mirage dolphin habitat – This is a petition we started in hopes to get the 5th largest school district in the nation to stop sending their students to the Mirage death pools. If these animals are not cared for properly by their handlers, how are we teaching our children about compassion? 2. Retire Dolphins to Ocean Sanctuary! – Facilities around the world are starting to change their business model due to public outcry. Help push Mirage to make history and become one of those facilities.